The Steam Oven is truly a unique oven that incorporates all the functions of a professional steam oven in a countertop footprint. Its a countertop convection oven with full steaming capability. Steam heat cuts cooking time up to 40%*! Choose from 9 single and combination functions. Steam or poach any type of vegetable, fish, poultry or rice... or use steam in combination with both Broil or Bake functions to create roasts that are beautifully browned on the outside, yet moist and juicy on the inside. Special settings allow you to proof breads, rolls - even homemade pretzels and donuts. Bake them faster, with bakery-quality results. High-tech toasting technology gets a high-style look with this sleek 2-slice stainless steel toaster featuring black accents. Not only will you impress your guests with its modern style but this unit also includes 4 functions with a LED light indicator for each: cancel toasting at any moment, reheat a previously toasted piece of bread, or automatically thaw a previously frozen piece of bread and lastly, toast bagels to perfection. This toaster also includes a slide-out crumb tray makes clean up hassle-free. Have complete control over your toasting! Wake your morning up with the chic Kalorik transparent glass side toaster! This toaster lets you see those slices gradually turning just the shade of golden brown that meets your preference. Not only is this appliance easy to use with its cancel, bagel, reheat and defrost functions, but clean up is hassle free with its slide-out glass frame and a removable crumb tray. Other great highlights are the toasters extra-lift that lets you use smaller pieces of bread, and the auto-shut-off and auto-centering guide features. 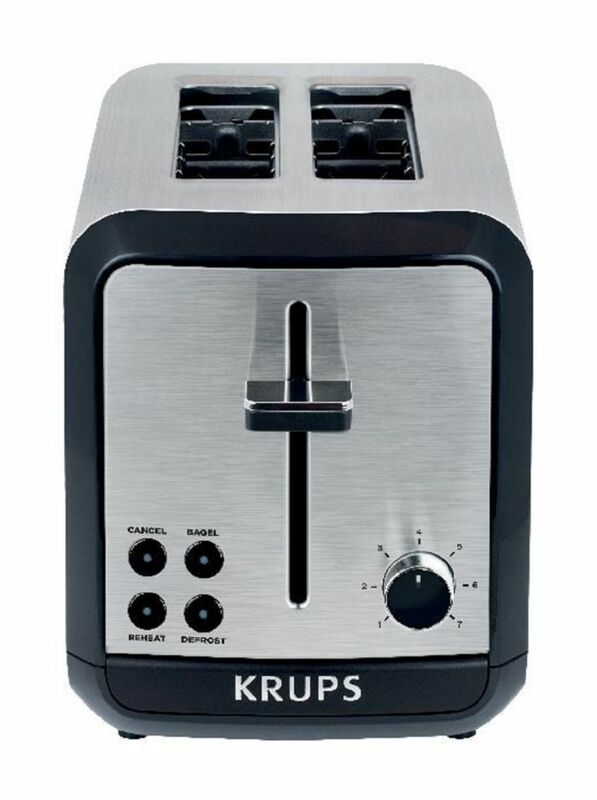 Be the first of your friends and family to own such a unique appliance and toast your bread in style! Make a statement on your counter with the newly designed KitchenAid<sup></sup> 2-Slice Toaster. This toaster features 7 shade settings, including Bagel, Defrost, Reheat and Keep Warm. A high lift lever is convenient for removing smaller slices of bread or to check toasting progress at any time. Savoy 2-Slice Toaster is rated 1.0 out of 5 by 2. Rated 1 out of 5 by David in Michigan from Extreme disappointment Responding to the mention of our Krups toaster in an article called "the best ...," we bought one (Model SERIE 737-A, Intertek 3197286) and have been less than happy with its performance. Regardless of setting, the toast is either over- or under-done + this morning, after some internal, seemingly electrical flashing, it refused to work at all. I thought it had tripped a circuit breaker, but it had not. It plain does not work at all now. After buying this with the Krups reputation in mind and its failure, we re extrememly disappointed.